The AQ2200-131 and AQ2200-132 are single and dual channel tunable light source modules. 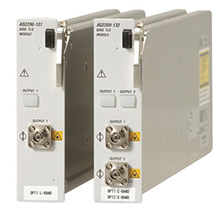 The output wavelength can be conveniently set to the predefined DWDM grid channels. Reduced energy, emission of CO2, NOX and SOX about 10% compared to the previous model.